Come visit Huxley’s Boarding House, home of the mysterious clock tower! We are an exclusive retreat for people who want to get away from it all and learn what life was really like in the Victorian Era – no phones, no technology! Our strict schedule of daily activities will help immerse you in the experience and must be adhered to at all times. The waiting list to get in is long, so sign up today! 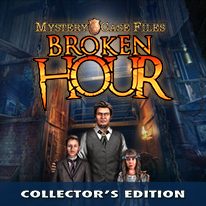 - Explore the origins of the Huxleys' horrors in the Bonus Game! - Unlock a special mini-game: Developer Hunt! - Tons of bonuses, including cut scene videos!